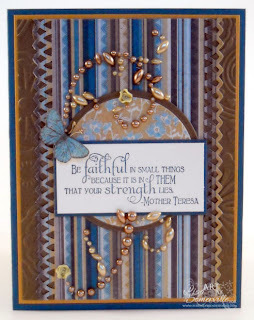 The Suede panel is embossed with a Cuttlebug Folder, the MME paper is punched with the Lattice Edge punch. 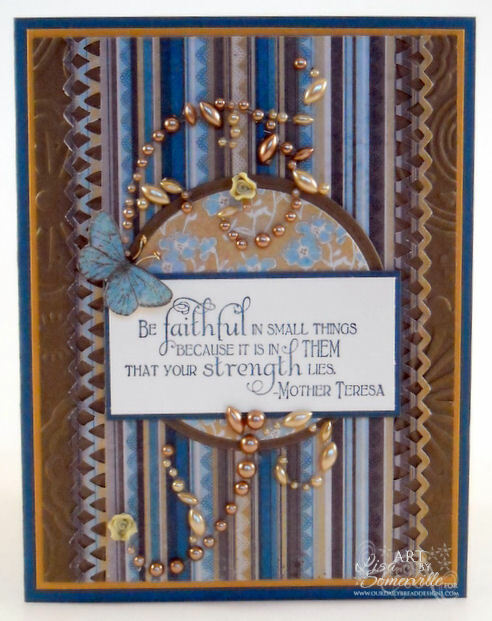 The Butterfly and sentiment are both from Our Daily Bread Designs Faith set. The Butterfly is stamped on a scrap of MME paper, then I added the antennae from a piece of wire. The flourish (thanks Kim) is from Prima. Wow, this is so beautiful, you use those flourishes like candy! Seems like I'm constantly telling myself no more paper, no more stamps until I use what I have...and then I cave! Gorgeous card!! That flourish is so neat! Love the lines behind the circle and the fancy flourish. They all make the sentiment pop even more. Beautiful card.